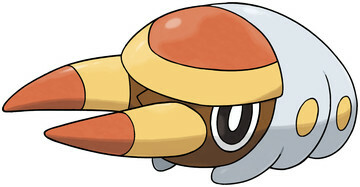 Grubbin is a Bug type Pokémon introduced in Generation 7. It is known as the Larva Pokémon . Grubbin relies on its sturdy jaw as a weapon in battle and as a tool for burrowing through the earth. Grubbin loves electricity, which is why it can be found near power plants and substations. By wrapping tree branches in the sticky threads that it spews from its mouth, Grubbin can swing around like an actor on suspension wires! The effectiveness of each type on Grubbin. If you find its nest, you shouldn’t stick your hand inside. You’ll get bitten by an irritated Grubbin. Grubbin learns the following moves in Pokémon Ultra Sun & Ultra Moon at the levels specified. Grubbin learns the following moves via breeding in Pokémon Ultra Sun & Ultra Moon. Details and compatible parents can be found on the Grubbin egg moves page. Grubbin learns the following moves in Pokémon Sun & Moon at the levels specified. Grubbin learns the following moves via breeding in Pokémon Sun & Moon. Details and compatible parents can be found on the Grubbin egg moves page. We don't have any Grubbin questions yet!